Ken Scott is legend in our world. Calling him an engineer or producer extraordinaire is putting it lightly for the man has been involved with some of our favorite records ever. Now, he’s written a memoir that details his career and notes how he achieved some of the sounds we’ve grown to cherish. 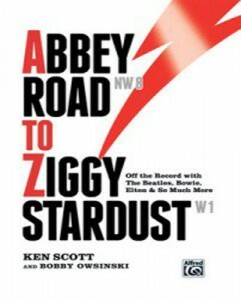 Subtitled ‘Off the Record with the Beatles, Bowie, Elton John and So Much More’ we sincerely look forward to hearing all about it and encourage you to pick this book up pronto. Published on June 6th this title is already the talk of the town. Ken Scott has worked with many major artists including Lou Reed, the Rolling Stones and Jeff Beck to name just a few. Co-written with Bobby Owsinski, the video promo (below) serves as a great teaser and even reveals a very rare photo of Mick Ronson in the studio. Apparently Scott pulls no punches and tells exclusive stories and the sort of specifics that you’ve come to expect from a book like this. Also the 393 page flashback boasts of 14 pages of never before seen photographs. Scott will make a special appearance at the Beatles Fest in Chicago next month for those of you who might consider planning a road-trip to congratulate Scott in person. Tell him Weird and Gilly sent ya.